Our range of Industrial Waste Incinerators are fully CE certified, ensuring that we meet the highest standards in safety and construction. We have a large range of UK DEFRA / APHA approved units which meet the EU and UK ABPR regulations for incineration of Animal By-Products. 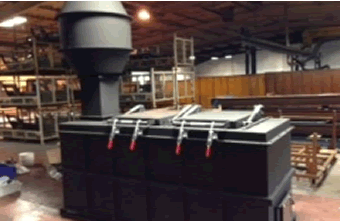 One of the main features of our Waste Incinerator range is that they burn smoke and smell free. The ease of operation make our units a key benefit on any waste disposal application by avoiding the need for constant supervision. Burn-rite use the latest technology in the design and build of all their incineration systems. Our approach gives not only exceptional service and value but provides reassurance and professionalism at every stage. Burn-rite offers a wide range of high quality Industrial Waste Incinerators to suit most on-site incineration requirements. Burn-rite’s running costs are the lowest in the industry due to the unique design and features of our range of General, Medical and Animal by-product waste incinerators and market leading burners. Burn-rite is committed to improving our environment and is constantly developing new technologies to reduce emissions and minimise thermal pollution. Our recycling technology works ‘hand in hand’ with reducing pollution and waste. Burn-rite’s environmentally friendly Industrial Waste Incinerators are constantly evolving and as part of our dedication and commitment we are happy to discuss our techniques and processes with any ‘anti-incinerator’ or ‘no incinerator’ groups. Burn-rite pride themselves on the highest level of customer support throughout the industry. Burn-rite can deliver your waste incinerator anywhere in the world. Burn-rite offer a 24/7 Technical Helpline that ensures that your incinerator is returned to operation in the shortest time possible in the unlikely event of a breakdown.